Classic games set precedents and create templates for future games to follow. Sometimes this comes in the form of an homage, and Freedom Planet is an homage to classic Sonic the Hedgehog games. This mixed with its own unique mechanics makes for a fun experience. 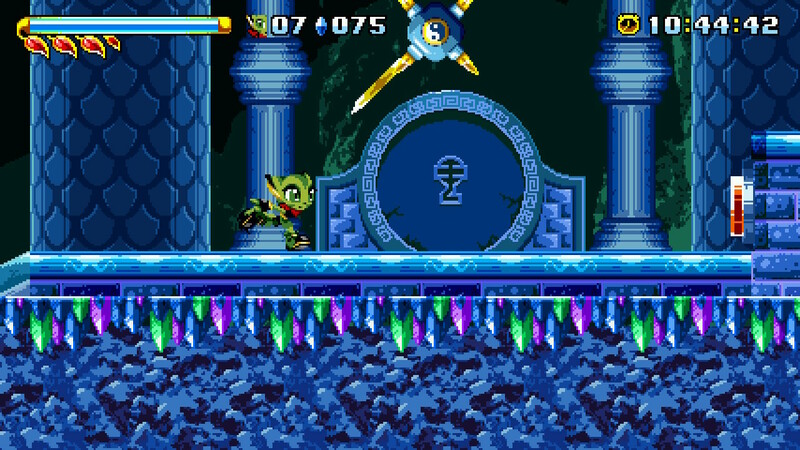 Freedom Planet focuses on the alien warlord Brevon invading the kingdom of Shuigang in pursuit of the kingdom stone. Our protagonists, Carol the wildcat and Lilac the dragon-girl, get pulled into this conflict after seeing a spaceship crash nearby. They meet Torque, who tells them about Brevon and his plans, which sets Carol and Lilac on a path towards stopping Brevon and protecting the kingdom stone. The kingdom stone is a source of incredible power, so failing to secure it would be a terrible loss for the people. There are two main modes to play: adventure mode and classic mode. Adventure mode lets you play through the levels with the story told through cutscenes, while classic mode only consists of the levels. If you only care about the gameplay, then you might opt for classic mode, but if you are interested in the story like me, then go for adventure mode. The story is actually pretty interesting, and it makes the game much more enjoyable. The quirky characters mixed with the high risk situations make for a great storytelling experience. When starting the game, you can choose to play as Carol or Lilac, with a third option unlocked after reaching a certain point in the game. Both characters follow the same story and go through the same stages for the most part. There are a few different scenes and levels for each character based on story events. Playing through the game more than once helps fill in some gaps, so I highly recommend you do so; not to mention, the game is fun on its own. Besides running, jumping, and a basic attack, each character has some special abilities. Carol can temporarily cling to walls and wall jump, use a rapid kick attack, and even ride a motorcycle if you find one of the gas can items sitting around. The motorcycle stays with Carol until she takes enough damage to destroy it, which is nice. Lilac can do a cyclone double jump, and use a dash to propel herself forward or at an upward angle. This is helpful for speeding through areas or reaching new heights. In order to use some of the special abilities, you consume energy. The rapid kick attack and cyclone jump both use smaller portions of the energy meter, while Lilac’s dash uses the whole meter. Energy regenerates fairly quickly when those abilities aren’t being used, so there’s no need to worry about conserving energy. Health on the other hand, comes in the form of reddish-orange leaves under the energy meter. In order to heal, you need to collect leaves that are scattered across the stages. When all of your leaves are depleted, you can take a little more damage before being killed. Then you respawn at a checkpoint, although the game doesn’t really give you any clear indications of what is considered a checkpoint. That being said, their placements are fair, and I never had to go far to get back to where I died. The gameplay itself is fast paced and fluid, feeling akin to the old school Sonic games. The aesthetic of the stages, along with the soundtrack, also give off that Sonic the Hedgehog vibe. For those who loved those games like I did, Freedom Planet does a wonderful job recreating them in its own way. The voice acting adds to the tone of the game and its characters, further pulling me into the story. Some people like to listen to music while they play games, but I’d say not listening to the voices and soundtrack of Freedom Planet would be a disservice to the game. All in all, Freedom Planet is an amazing homage to the Sonic the Hedgehog series and is easily worth picking up, especially for its relatively low price. The game runs well in docked and handheld mode, so get ready to rock as Carol and Lilac at home and on the go. Freedom Planet is a wonderful Sonic the Hedgehog-esque game that mixes nostalgia with something new. The quirky characters, fantastic levels, and interesting story will make you not want to put the game down. Each character has their own advantages and disadvantages, encouraging you to test them all out. In the end, it's the whole package, and it's worth picking up.